The emergence of nanotechnology has created a diversity of nanomaterials with superior physical and chemical properties. As many of them are cell permeable, they are commonly designed to assemble drugs or biomolecules, and serve as intracellular delivery vehicles for gene regulation and imaging purposes[1-4]. In a different line, the biosafety issue of nanomaterials has raised intense concerns worldwide. In particular, great efforts have been made to examine the cytotoxicity and the biocompatibility of nanomaterials[5-9]. Although many types of nanomaterials have shown low cytotoxicity and no obvious effect on cell growth, it is yet to determine whether they can interfere with other important cellular functions, such as cell fate determination, energy homeostasis, cell communication and signaling, all of which play fundamental roles during development, metabolism and aging. For example, although gold nanoparticles (NPs) are generally considered non-toxic to cell growth, they may have long-term effects on cellular metabolism and energy homeostasis. Repeated carbon nanotube administrations in male mice do not exhibit harmful effects on their fertility, whereas reversible damage in the testis is observed. While CdTe/CdS/ZnS quantum dots show low cytotoxicity by themselves, they can induce autophagy that sensitizes cells to low levels of cadmium ions. Our recent study also suggests that iron oxide NPs can actively affect aging and neurodegeneration in Drosophila. Therefore, it is important to investigate the biocompatibility of nanomaterials in various biological contexts. Wnt signaling controls a variety of physiological processes including embryonic axis elongation and segmentation, organ development, tissue homeostasis and stem cell maintenance[14, 15]. In addition, dysregulation of Wnt signaling is tightly implicated in human diseases such as cancer and metabolic disorders. The Wnt ligand serves as a switch for this signaling pathway. In the absence of Wnt, expression of Wnt target genes is prevented because a critical transcription co-activator called β-Catenin is degraded. A “destruction complex”, which is composed of two scaffold proteins APC and Axin, and two kinases GSK3β and CKI, mediates phosphorylation of β-Catenin and targets it for degradation via the proteasome pathway. 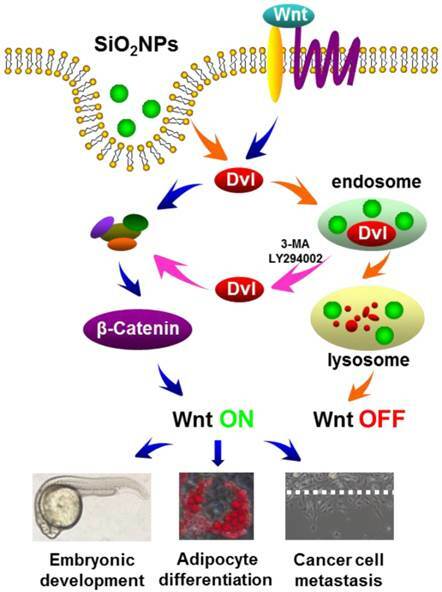 Binding of Wnt ligand to its receptor at the cell surface primes a signaling cascade, which involves activation of an intracellular signal transducer called Dishevelled (Dvl), subsequent inhibition of the destruction complex, and thereby stabilization of β-Catenin proteins. Expression of Wnt target genes is activated after β-Catenin enters the nucleus and binds to target loci. Therefore, the Wnt ligand, together with the Wnt receptor, Dvl, the destruction complex and β-Catenin, constitutes a central signaling axis through which Wnt signal regulates multiple biological processes (Scheme 1, blue arrow-guided pathway). The effects of silica NPs on Wnt signaling. Wnt signal is transduced via its receptor, Dvl, the degradation complex and β-Catenin, through which Wnt regulates its target gene expression and multiple biological processes (blue arrow-guided pathway). Cellular uptake of silica NPs promotes Dvl degradation via the endosome-lysosome pathway, and prevents Wnt signal transduction (orange arrow-guided pathway). Blocking the endosome-lysosome pathway enables Dvl to avoid silica NPs-induced degradation and rescues Wnt signaling (purple arrow-guided pathway). In this study, we investigate biological consequences and molecular mechanisms of silica NPs on cellular signal transduction, particularly on the Wnt signaling pathway. Silica NPs (also referred as SiO2NPs) have been extensively employed as a model system for nanotoxicological studies[19, 20]. Previous studies have well documented that silica NPs with appropriate size, surface charge, porosity and reasonable dosage are minimally cytotoxic and generally biocompatible, thereby attracting intense attention for biomedical imaging and therapeutic applications[21, 22]. SiO2NPs carrying molecular probes have provided efficient approaches for in vivo bioimaging without causing any obvious toxicity or tissue damage in mice. As a drug delivery vehicle, mesoporous SiO2NPs can load a wide range of anti-cancer compounds, antibodies or functional nucleic acids for targeted tumor imaging and therapy[24-26]. Here, we aim to explore whether this type of “biocompatible” nanomaterials can potentially interfere with other complicated cellular activities and functions under various physiological or pathological conditions. Since Wnt signaling play pivotal roles in embryonic and postnatal development, adult metabolism, cancers and metabolic diseases, we expect that revelation of connections between silica NPs and Wnt signaling may have important physiological, pathological and therapeutic implications beyond toxicity. Our results show that SiO2NPs used in this study are non-toxic to cell growth. However, we find that they can specifically attenuate Wnt signaling-activated gene expression in 293T human embryonic kidney cells. Consistent with this finding, cellular uptake of SiO2NPs blocks Wnt functions in various biological contexts, diminishing its anti-adipogenic activity in 3T3-L1 preadipocytes and pro-invasive activity in MDA-MB-231breast cancer cells. In addition, SiO2NPs impair tail elongation in Zebrafish embryos. This phenotype is rescued by enhancing the downstream of Wnt signaling, confirming that SiO2NPs affect embryonic development by weakening physiological Wnt signaling instead of general toxicity. We further demonstrate that intracellular SiO2NPs act in a way resembling signaling molecules. Specifically, SiO2NPs target the Wnt signal transducer Dvl for lysosomal degradation and thereby turn off Wnt signaling (Scheme 1, orange arrow-guided pathway). Besides, blocking the endosome-lysosome pathway can prevent SiO2NPs-induced Dvl degradation and rescue its activity in Wnt signaling (Scheme 1, purple arrow-guided pathway). Our work thus identifies novel effects of SiO2NPs on cellular signal transduction, and illustrates a molecular link between nanomaterials and the Wnt signaling pathway. In our initial test, we examined cytotoxic effects of several types of widely used nanoparticles, which had similar hydrodynamic diameters (100-135 nm) and zeta potentials (around -20 mV) in cell culture medium (Table S1). Except for ZnONPs, which showed obvious cytotoxicity, SiO2NPs and Fe3O4NPs had neglectable effects on the viability of 293T human embryonic kidney cells at concentrations between 10 μg/mL and 100 μg/mL (Figure S1). We next asked the question whether these two types of nanoparticles can interfere with Wnt signaling in 293T cells even if they did not hamper basic cell growth. The TOPFlash luciferase reporter is commonly used to measure the activity of Wnt signaling in cultured cells. It has basal expression in the absence of Wnt stimulation, and is specifically activated by signals transduced from Wnt ligand or other stimulators of the Wnt signaling pathway. Consistent with their low cytotoxicity, 10-100 μg/mL SiO2NPs and Fe3O4NPs did not affect the basal expression of TOPFlash reporter in the absence of Wnt3a ligand. However, SiO2NPs significantly suppressed the activated expression of TOPFlash reporter in the presence of Wnt3a, while Fe3O4NPs had no effect under the same condition (Figure 1A and Figure S2). In this assay, nanoparticles and Wnt3a ligand were added into cell culture medium at the same time. To exclude the possibility that SiO2NPs might interfere with Wnt3a binding to its receptor on the cell surface, we pre-incubated these nanoparticles with 293T cells. Intracellular localization of SiO2NPs was easily detected after pre-incubation (Figure S3). We then washed cell surface to remove remaining nanoparticles before adding Wnt3a. Under this condition, pre-incubated SiO2NPs still suppressed Wnt3a-activated expression, but not the basal expression of TOPFlash reporter (Figure 1B). We also measured expression of TOPFlash reporter at different time points after nanoparticles were added. 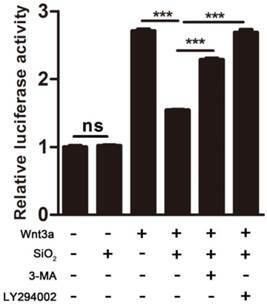 SiO2NPs showed continuous inhibitory effect on Wnt3a-mediated signaling in 293T cells (Figure 1C). As 100 μg/mL SiO2NPs showed strongest repression on Wnt signaling as well as high biocompatibility, we used this concentration in later experiments. The above results suggest that SiO2NPs, although seem to be compatible with cell growth within our tested dosage, may have an adverse effect on Wnt signal transduction. Since Wnt signaling has profound roles in embryonic and postnatal development, metabolism and aging, our observation implies possible influence of SiO2NPs in these biological processes. Therefore, we next investigated the effects of SiO2NPs on Wnt signaling-regulated cell functions under different environmental cues. Wnt signaling is a key modulator of adipogenesis and maintains preadipocytes in an undifferentiated state[28, 29]. Here we examined the effects of SiO2NPs on Wnt signaling-regulated adipocyte differentiation. The 3T3-L1 preadipocytes were induced to differentiate by combinatory effects of insulin, dexamethasone (Dex), and 3-isobutyl-1-methylxanthine (IBMX). SiO2NPs did not affect differentiation of 3T3-L1 cells induced by this hormone cocktail, indicating that this type of nanoparticles did not directly interfere with these hormone signaling pathways (Figure 2A). While this induced differentiation of 3T3-L1 cells was largely prevented by Wnt3a, SiO2NPs significantly reversed the inhibitory effect of Wnt3a on adipogenesis (Figure 2B and Figure S4). To investigate the molecular changes underlying our observation, we monitored expression of adipogenic genes including PPARγ, Glut4 and Perilipin (PLIN). SiO2NPs did not interfere with expression of these adipogenic genes in the absence of Wnt signaling. In contrast, they strongly weaken the suppressive effect of Wnt3a on adipogenic gene expression (Figure 2C). Intracellular SiO2NPs attenuate Wnt signaling in 293T cells. (A) The effect of SiO2NPs (10, 50 and 100 μg/mL) on basal expression and Wnt3a-induced expression of TOPFlash reporter. (B) The effect of pre-incubated SiO2NPs (10, 50 and 100 μg/mL) on basal expression and Wnt3a-induced expression of TOPFlash reporter. (C) The effect of pre-incubated SiO2NPs (100 μg/mL) on basal expression and Wnt3a-induced expression of TOPFlash reporter at different time points. All firefly luciferase activities were normalized to renilla luciferase activities. Data represented as mean ± s.d. (n=3). Student's t-test, ns not significant; ** p<0.01; *** p<0.001. 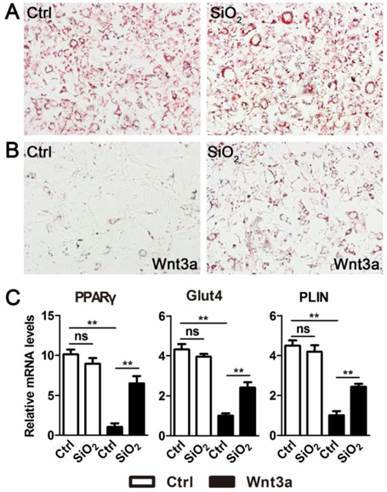 SiO2NPs inhibit the effect of Wnt signaling on adipocyte differentiation. (A and B) The effect of SiO2NPs on 3T3-L1 differentiation in the absence (A) or presence (B) of Wnt3a. (C) The effect of SiO2NPs on expression of adipogenic genes (PPARγ, Glut4 and PLIN) in the absence or presence of Wnt3a. Data represented as mean ± s.d. (n=3). Student's t-test, ns not significant; ** p<0.01. SiO2NPs block Wnt-regulated metastasis of cancer cells. (A and B) The effect of SiO2NPs on metastasis of MDA-MB-231 breast cancer cells in the absence (A) or presence (B) of Wnt3a. Images were recorded at the time of wounding (0 h) and 48 h after wounding. (C) Quantification of the effect of SiO2NPs on MDA-MB-231 cell migration in the absence or presence of Wnt3a. Data represented as mean ± s.d. (n=3). Student's t-test, ns not significant; *** p<0.001. In addition to a pivotal role in adipogenesis, Wnt signaling also controls metastasis of cancer cells[31, 32]. We next examined the effects of SiO2NPs on Wnt signaling-regulated cell migration in the MDA-MB-231 breast cancer cell line. In a wound healing assay, SiO2NPs did not show noticeable effect on migratory speed of MDA-MB-231 cells in the absence of Wnt signaling (Figure 3A). Consistent with previous studies, Wnt signaling enhanced metastasis of MDA-MB-231 cells. However, this pro-invasive effect by Wnt was abolished in the presence of SiO2NPs (Figure 3B,C). Many Wnt target genes are involved in the process of cell metastasis. We explored the effects of SiO2NPs on expression of these genes, including c-Myc, Lef1, Axin2, Cyclin D1 and p21Cip1, in MDA-MB-231 cells after the wound healing assay. In the absence of Wnt3a, SiO2NPs had no effect on basal expression of these genes. Wnt signaling upregulated expression of c-Myc, Lef1, Axin2 and Cyclin D1, and downregulated that of p21Cip1. SiO2NPs could dampen the activity of Wnt signaling in controlling its target gene expression (Figure S5). Thus, in two sets of independent cell-based assays, we found that SiO2NPs did not interfere with cell functions in a basal state, but specifically blocked Wnt signaling-mediated effects on these physiological or pathological processes. We next investigated the effects of SiO2NPs in the in vivo environment, where endogenous Wnt ligands were spatially and temporally expressed to regulate a variety of biological processes. In Zebrafish embryos, active Wnt signaling is essential for proper tail formation. Perturbation of Wnt signaling results in shortening and bending of the tail[34, 35]. This phenotype is very similar to the situation in human that insufficient Wnt signaling causes developmental defects in somitogenesis and osteogenesis, thereby leading to embryonic mortality or postnatal bone disorders (e.g. osteoporosis-pseudoglioma syndrome and Jarcho-Levin syndrome)[36, 37]. Therefore, this model is widely used to identify important regulators of the Wnt pathway. Here we used this model to explore the in vivo effects of SiO2NPs on Wnt signaling. Incubation with SiO2NPs caused aberrant tail elongation in more than 65% Zebrafish embryos, compared to 3% in the control (Figure 4A,C). To confirm that our observation reflected specific inhibition of Wnt signaling rather than general toxicity by these nanoparticles, we tested whether this phenotype could be rescued by restoring endogenous Wnt signaling. Lithium chloride (LiCl) is an inhibitor of GSK3β kinase, and can activate the downstream of Wnt signaling bypassing the requirement for upstream components such as the Wnt ligand. 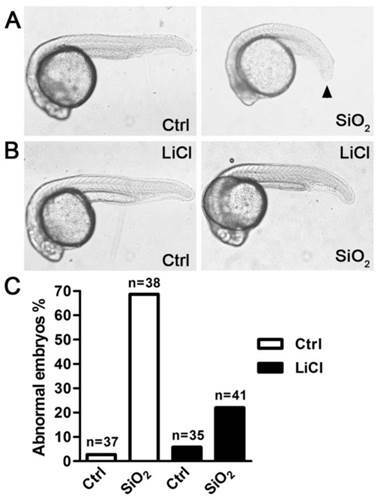 In the presence of LiCl, the defect in tail elongation caused by SiO2NPs was largely rescued and only occurred in less than 25% Zebrafish embryos (Figure 4B,C). 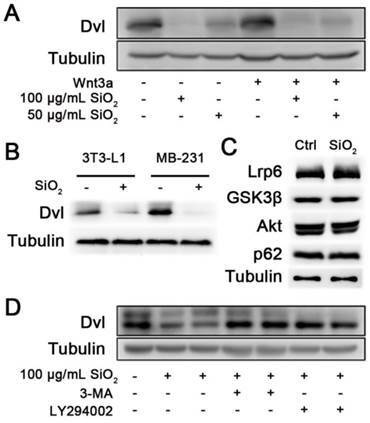 These results suggest that SiO2NPs interfere with physiological functions of Wnt signaling in vivo, and may act upstream of the GSK3β kinase. SiO2NPs impair Wnt-regulated embryonic development in Zebrafish. (A and B) The effect of SiO2NPs on tail elongation of Zebrafish embryos in the absence (A) or presence (B) of 20 mM lithium chloride. (C) Quantification of abnormal embryos under various conditions. The number of embryos examined under each experimental condition is indicated above the bar. The GSK3β kinase is a component of the β-Catenin destruction complex. The above clue prompted us to examine upstream components of Wnt signaling in the presence of SiO2NPs. After the Wnt ligand binds to activate its receptor, an intracellular protein Dvl senses the changes on the membrane and functions to inhibit the destruction complex. We therefore investigated whether SiO2NPs affected Dvl. In 293T cells, the mRNA level of Dvl was unaffected by SiO2NPs treatment (Figure S6). In contrast, SiO2NPs significantly reduced the protein level of Dvl in a dosage-dependent manner, and this effect was independent of Wnt stimulation (Figure 5A). These pieces of data indicate that SiO2NPs affect the turnover of Dvl protein rather than its gene transcription. Similarly, cellular uptake of SiO2NPs also diminished protein levels of Dvl in 3T3-L1 and MDA-MB-231 cells, suggesting that our observations in above assays were caused by the effect of SiO2NPs on this Wnt signal transducer (Figure 5B). SiO2NPs promote lysosomal degradation of Dvl. (A) The effect of SiO2NPs on protein levels of Dvl in the absence or presence of Wnt3a in 293T cells. (B) The effect of 100 μg/mL SiO2NPs on protein levels of Dvl in 3T3-L1 and MDA-MB-231 cells. (C) The effect of 100 μg/mL SiO2NPs on protein levels of Lrp6, GSK3β, Akt and p62 in 293T cells. (D) The effect of 100 μg/mL SiO2NPs on protein levels of Dvl in the absence or presence of 3-MA or LY294002 in 293T cells. The finding that SiO2NPs affect the protein level of Dvl leads to an important question whether SiO2NPs have a generally adverse effect on cellular proteins. We examined the effect of SiO2NPs on the protein level of Lrp6, a transmembrane protein acting upstream of Dvl in Wnt signaling, and that of GSK3β, a Wnt signal transducer functioning downstream of Dvl. However, protein levels of both Lrp6 and GSK3β in 293T cells were unaltered by SiO2NPs treatment (Figure 5C). We additionally examined signaling components outside of the Wnt pathway. Akt is a key signal transducer in the metabolic pathway. The protein level of Akt was unaffected in the presence of SiO2NPs (Figure 5C). p62 is a cytoplasmic adaptor protein and shares the same degradation pathway with Dvl[40-42]. We also found that the protein level of p62 was not affected by SiO2NPs treatment (Figure 5C). In addition, we examined the specificity of SiO2NPs on protein degradation in MDA-MB-231 cells. SiO2NPs treatment did not affect protein levels of Lrp6, GSK3β, Akt and p62 as well (Figure S7). Therefore, it is unlikely that SiO2NPs generally downregulate cellular proteins. Dvl is predominantly degraded in the lysosome. If SiO2NPs induce Dvl degradation, blockage of the lysosomal degradation pathway should be able to rescue this phenomenon. Indeed, incubation with either 3-methyladenine (3-MA) or LY294002, which blocked the initiation step of the lysosomal degradation pathway, restored the protein level of Dvl that was diminished by SiO2NPs treatment (Figure 5D). We next looked for direct evidence that supported our hypothesis and examined the subcellular localization of Dvl. Consistent with previous studies, the Dvl protein appeared as punctate structures in cells[43, 44]. In the absence of nanoparticles, Dvl rarely localized in the lysosome. Only less than 5% Dvl protein was found to co-localize with the lysosomal marker Lamp1 (Figure 6A and Figure S8). In contrast, around 40% Dvl protein co-localized with Lamp1 in the presence of SiO2NPs (Figure 6B and Figure S8). Incubation with 3-MA or LY294002 greatly reduced SiO2NPs-mediated effect on Dvl localization. Less than 10% Dvl protein localized in the lysosome upon 3-MA or LY294002 treatment (Figure 6C,D and Figure S8).These results confirm that SiO2NPs target Dvl to the lysosomal degradation pathway. Since 3-MA and LY294002 could prevent SiO2NPs targeting Dvl to the lysosome and restore Dvl protein levels, we were wondering if the activity of Dvl was rescued. Indeed, incubation with 3-MA or LY294002 rescued SiO2NPs-mediated repression of Wnt signaling in 293T cells (Figure 7). 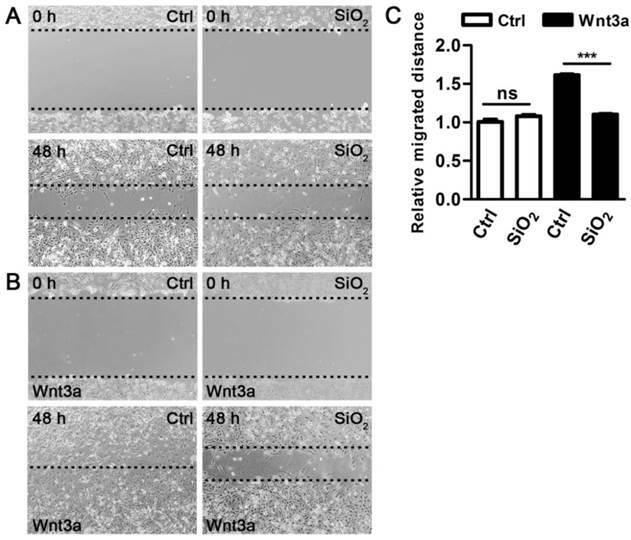 This result confirms that the effects of SiO2NPs on Wnt signaling depend on the lysosomal degradation pathway, and suggests that SiO2NPs can be used as a type of reversible inhibitor of Wnt signaling for therapeutic purposes. SiO2NPs target Dvl to the lysosome. 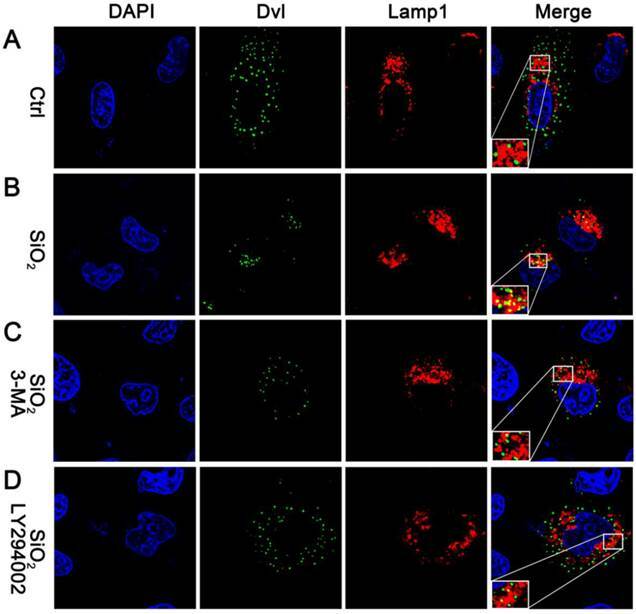 Confocal microscopy images display the nucleus (indicated by DAPI staining), the localization of Dvl (indicated by Dvl2-GFP) and the lysosome (indicated by Lamp1-RFP) in (A) control cells, (B) cells incubated with SiO2NPs, (C) cells incubated with SiO2NPs and 3-MA, and (D) cells incubated with SiO2NPs and LY294002. SiO2NPs have reversible effect on Wnt signaling. The effect of SiO2NPs on Wnt3a-induced expression of TOPFlash reporter was examined in the absence or presence of 3-MA or LY294002. Data represented as mean ± s.d. (n=3). Student's t-test, ns not significant; *** p<0.001. Nanomaterials that are compatible with cell survival or proliferation have shown great promise in biomedical research and applications. Although their in vivo applications do not cause noticeable organ toxicity or tissue damage in adult animals, the profound effects of these “biocompatible” nanomaterials under other physiological or pathological conditions are less explored. In this study, SiO2NPs show low cytotoxicity in several types of cell lines and in Zebrafish. However, we find that they can specifically attenuate Wnt signaling, thereby affecting Wnt-mediated physiological or pathological processes. While Wnt signaling is essential for regulation of development and metabolism, over-activation of Wnt signaling is closed related to tumorigenesis and tumor progression[14, 16, 28, 37]. Therefore, the in vivo effects of SiO2NPs may vary depending on their biological contexts. Firstly, SiO2NPs impair Wnt-regulated tail elongation in Zebrafish embryos. Similar defects in human, attributed to insufficient Wnt signaling at embryonic or fetal stage, can induce developmental defects in somitogenesis and osteogenesis, and lead to embryonic mortality or postnatal bone disorders such as the osteoporosis-pseudoglioma syndrome and the Jarcho-Levin syndrome[36, 37]. 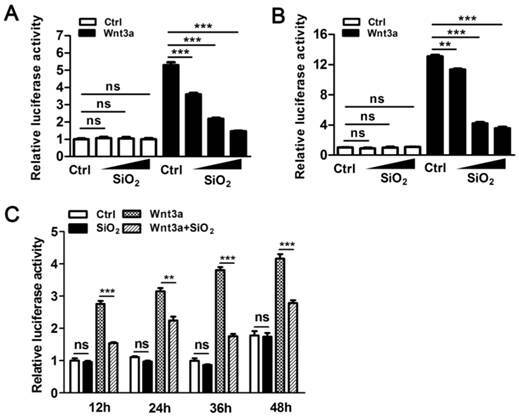 Secondly, exposure to SiO2NPs can hamper the anti-adipogenic effect of Wnt signaling on adipocyte differentiation, and may increase the risk of obesity in postnatal life. In contrast, SiO2NPs can block Wnt-induced metastasis of cancer cells, a well-defined function of oncogenic Wnt signaling. Therefore, targeted application of SiO2NPs may greatly benefit cancer therapies. Invasion and metastasis of cancer cells are largely attributed to over-activated Wnt signaling in tumor tissues[31, 32]. Utilization of SiO2NPs, either as a therapeutic agent or a delivery vehicle, can help to inhibit pathological responses to oncogenic Wnt signaling. Our study also identifies novel mechanisms through which nanomaterials affect cellular signaling pathways. We find that intracellular SiO2NPs resemble signaling molecules to block Wnt signal transduction. Wnt signal is transduced via its receptor, Dvl, the degradation complex and β-Catenin, through which Wnt signaling regulates its target gene expression and multiple biological processes (Scheme 1, blue arrow-guided pathway). Significantly, SiO2NPs can target the Dvl protein, a key component of Wnt signaling cascade, to the lysosomal degradation pathway. To our knowledge, such property of nanomaterials has never been shown by previous studies. Our study does not elucidate how SiO2NPs target Dvl to the lysosome. However, as endocytosis of SiO2NPs is mediated by the endosome-lysosome pathway[45-47], which largely overlaps with the degradation pathway of Dvl proteins, it is conceivable that cellular uptake of SiO2NPs may create large amounts of endocytic vesicles and increase trap of Dvl proteins in the endosome, thereby promoting the destiny of Dvl in the lysosome (Scheme 1, orange arrow-guided pathway). The finding that SiO2NPs trigger Dvl degradation raises the question whether SiO2NPs specifically affect Dvl, or they generally affect the turnover of a bulk of proteins. We have examined the effect of SiO2NPs on protein levels of Lrp6 and GSK3β, two Wnt signal transducers acting upstream of and downstream of Dvl, respectively. We have also examined Akt, a key signal transducer in the metabolic pathway, and p62, a cytoplasmic adaptor protein that shares the same degradation pathway with Dvl. In contrast to Dvl, these proteins are not affected by SiO2NPs. Therefore, it is unlikely that SiO2NPs have a generally adverse effect on cellular proteins. The specific effect of SiO2NPs on Dvl protein stability may be partially attributed to the distinct degradation pathway of Dvl. Dvl is one of a few cytoplasmic proteins that are degraded via the lysosomal pathway, whereas most cytoplasmic and nuclear proteins are degraded via the proteasome pathway. The turnover of these proteins is less likely to be affected by the endocytosis of SiO2NPs because they are localized in different subcellular compartments. Although it is possible that cellular uptake of SiO2NPs can bring some transmembrane receptors to the endosome, these proteins are recycled to the cell membrane in the absence of ubiquitination and thereby avoid lysosomal degradation. In addition, the intrinsic property of Dvl may also contribute to the effect of SiO2NPs. p62 is another cytoplasmic protein that is degraded via the lysosomal pathway[40, 41], whereas its stability is unaffected by SiO2NPs. Therefore, the effect of SiO2NPs on Dvl cannot reflect a general effect on protein turnover. However, other protein targets of SiO2NPs may exist and will be an interesting subject for future study. In conclusion, our work identifies novel effects of SiO2NPs on cellular signal transduction, expands our understanding of biological consequences induced by nanomaterials, and demonstrates a novel molecular link between nanomaterials and the Wnt signaling pathway. SiO2NPs, ZnONPs and Fe3O4NPs were from DKnano Technology. Dulbecco's modified Eagle's medium (DMEM) and fetal bovine serum (FBS) were from Invitrogen. Thiazolyl blue tetrazolium bromide (MTT), Oil red O, 3-MA, LY294002, IBMX, dexamethasone and insulin were from Sigma-Aldrich. Wnt3a was from R&D systems. Human embryonic kidney (HEK) 293T cell line, mouse 3T3-L1 preadipocyte cell line and human MDA-MB-231 breast cancer cell line were from the Cell Bank of Chinese Academy of Sciences. The AB strain of Zebrafish (Danio rerio) was maintained at 28.5 ºC in an Aquatic Habitats for Accelerated Bioresearch (AHAB) recirculating filtered water system (Aquatic Habitats), on a 14 hr light/ 10 hr dark cycle. Zebrafish embryos were obtained by natural spawning, placed in system water after fertilization, and treated with 100 μg/mL SiO2NPs or 20 mM lithium chloride for 24 hrs. The apparent hydrodynamic size and the zeta potential of nanoparticles in cell culture medium (completed DMEM containing 10% FBS) were measured with the Zetasizer (nano ZS90, Malvern Instruments). The cytotoxicity of nanoparticles in HEK-293T cells was measured by MTT assay. Briefly, cells were cultured in 96-well plates. MTT solution was added to each sample and incubated at 37 °C for 4 hrs. Cells were then lysed with 10% acid SDS solution (pH 2~3). After centrifugation, the absorbance of supernatant was measured at 570 nm using a microplate reader (Bio-Rad 680). HEK-293T cells were cultured in 96-well plates. The pRL-TK renilla luciferase reporter and the TOPFlash firefly luciferase reporter were co-transfected with the Lipofectamine 3000 reagent (Thermo Fisher Scientific). Wnt3a induction (at 50 ng/mL) was performed 12 hrs after transfection. After cells were lysed, the luciferase activity was measured with the Dual-Luciferase Reporter Assay System (Promega) following the manufacturer's instructions. The activity of firefly luciferase was normalized to that of renilla luciferase. Nanoparticles of various concentrations (10 μg/mL, 50 μg/mL and 100 μg/mL) were added into medium to examine their effects on the relative luciferase activity. MDA-MB-231 breast cancer cells were cultured in DMEM containing 10% FBS in 12-well plates. Confluent cells were scratched with 200ul sterile pipet tips, washed three times with phosphate-buffered saline (PBS), and cultured in DMEM containing 2% FBS. The cells were then incubated with 100 μg/mL SiO2NPs in the absence or presence of 100 ng/mL Wnt3a. Phase contrast microscopy images were recorded at the time of wounding (0 hr) and 48 hrs after wounding. These cells were then used for quantitative detection of Wnt targets expression. Migrated distances of MDA-MB-231 cells under various conditions were quantified with the ImageJ software. 3T3-L1 preadipocytes were cultured in DMEM containing 10% newborn calf serum. Two days after confluency (referred as day 0), cells were induced with the differentiation cocktail (DMEM containing 10% FBS, 0.5 mM IBMX, 1 μM dexamethasone and 10 μg/mL insulin) in the absence or presence of 100 μg/mL SiO2NPs. Two days later (day 2), the medium was replaced by DMEM containing 10% FBS and 10 μg/mL insulin. On the day 4 and day 6, the medium was replaced by DMEM containing 10% FBS. For Wnt signaling mediated inhibition of differentiation, 100 ng/mL Wnt3a was added into medium on the day 0, day 2, day 4 and day 6. Differentiation was completed on the day 8. The cells were then stained with Oil red O, or used for RNA extraction. For Oil red O staining, cells were fixed in PBS containing 4% formaldehyde for 20 mins at room temperature, stained with 0.6% Oil red O for 30 mins, and washed three times with 75% ethanol. Quantification of adipogenesis was analyzed with the ImageJ software. Total RNA was extracted from HEK-293T cells, induced 3T3-L1 preadipocytes or MDA-MB-231 breast cancer cells with the Trizol reagent (Invitrogen). One microgram of total RNA was reverse-transcribed into complementary DNA with the Rever TraAce qPCR RT Kit (TOYOBO). Quantitative PCR was performed with SYBR Green Real-time PCR Master Mix (TOYOBO), and gene expression was analyzed on the StepOne real-time PCR system (Applied Biosystems). Expression levels of GAPDH were used as an internal control for normalization of gene expression levels. For detection of Dvl localization, HEK-293T cells were cultured on poly-L-lysine-coated coverslips. Cells were co-transfected with GFP-tagged Dvl2 and RFP-tagged Lamp1. Following incubation with 100 μg/mL SiO2NPs, 5 mM 3-MA or 50 μM LY294002, cells were fixed in PBS containing 4% formaldehyde for 20 mins at room temperature. They were then washed three times in PBS containing 0.1% Triton X-100, followed by DAPI staining and fluorescence imaging with confocal laser scanning microscope (LSM 510 NLO, Zeiss). The co-localization between Dvl and Lamp1 was quantified with the ImageJ software. To measure specific protein levels in HEK-293T cells, 3T3-L1 cells or MDA-MB-231 cells, cultured cells were incubated with SiO2NPs in the absence or presence of 100 ng/mL Wnt3a, 5 mM 3-MA or 50 μM LY294002 for 24 hrs, followed by western blotting analysis with rabbit anti-Dvl2 (1:1000, Cell Signaling Technology 3224), rabbit anti-Lrp6 (1:1000, Cell Signaling Technology 3395), mouse anti-GSK3β (1:1000, Millipore 05-412), rabbit anti-Akt (1:1000, Cell Signaling Technology 4691), rabbit anti-p62 (1:1000, Abcam ab91526) and mouse anti-Tubulin (1:3000, Sigma-Aldrich T6074) antibodies. We would like to dedicate this article to Professor Qing Huang. This study was supported by National Natural Science Foundation of China (31322039, 31371493, 31571498, U1332119, 31371015 and 31470970), Science and Technology Service Network Initiative from Chinese Academy of Sciences (KFJ-EW-STS-099), Youth Innovation Promotion Association from Chinese Academy of Sciences (2015211) and the Shanghai Municipal Commission for Science and Technology (13NM1402300). We also acknowledge the support from Visiting Professor Program at King Saud University.